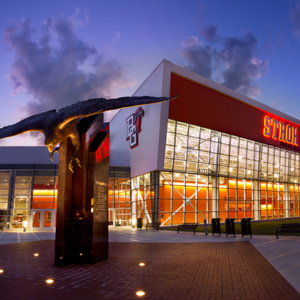 The Stroh Center is the home of the Falcon men’s and women’s basketball and volleyball programs. It is also a state-of-the-art venue for concerts, commencements, lectures, and numerous campus and community events. The facility includes locker rooms, meeting rooms, coaching staff offices for the teams, the BGSU Athletics Hall of Fame, the Falcon's Nest Team Store, a ticket office, and the Schmidthorst Pavilion. Very informative and fun, I love my new pin! A great atmosphere, with The Falcon Marching Band and the student examples. A very candid, and Frank approach to opening week. Well done from the President on down. I miss not getting a convocation pin, but I'm not a student either....I get that. Sound system was problematic for clarity especially in the stands on the side where we were. One of the speakers even thought that no one was listening, when the system didnt pick his voice up very well...tech issue I believe. Overall Great Day!